How can you find a tick on your pet? Is your rabbit vaccination up to date? Uh oh….Dog eats mushroom….what to do? Why would you suddenly start to wee in the house? Uh oh….Your dog eats a mushroom….what to do? Three times this week we have had dogs present having eaten wild mushrooms….. What to do? Unless you have a PhD in mushroom identification it is very difficult to tell the difference between a safe and a toxic mushroom. 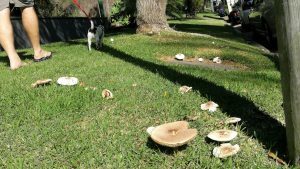 The recent rain has meant your backyard and the local nature strips are a minefield for the mushroom loving pup. Luckily young Neville pictured seems quite uninterested. He limits his scavenging efforts to sultanas, chocolates, school wraps (usually straight from the school bag), compost and strangely…. passion-fruit tea bags. The problem is we don’t know enough about each individual wild mushroom to know if they are safe or not. We do know some are poisonous! If your dog is unwell after eating mushrooms we may also suggest blood tests or even supportive care on intravenous fluids. It is so great to have the rain….. but watch out for the mushrooms. Public Holidays: Open Easter Saturday, Easter Monday and October Long Weekend. Pittwater Animal Hospital is easily located on Pittwater Road in Warriewood. We have off-street parking for your convenience. Great Experiece, I have been bringing my cats and dog here for a while. Kind and helpful, the Vets and nurses are all wonderful! The whole team are so lovely, knowledgeable, compassionate and professional. I had back to back problems with my puppy (Misha) and Dr Jill King and team were absolutely incredible to deal with. I felt so looked after and felt really confident in the care they delivered. I can’t recommend Jill and team enough. Thanks guys and keep the great work up! The staff are awesome they really treat your fur baby well. Highly experienced, skilldd and caring vets. Put your pets first. Beautiful staff and above and beyond service, wouldn't go anywhere else!! We had a one sick pup who was bitten by a paralysis tick. Thanks to the staff, she is now fully recovered and can walk again!! Can't thank you enough for all that you did to help us! Great staff and service. My dog was happy. Our dog was well cared for by Heidi. Great place. Wonderful and caring. They were amazing with our gorgeous boy, Oscar, and since then we have been bringing Teddy (kitten) and Annabelle (puppy) cared for by Jen. Our pets love coming here. Annabelle loves the treats! Recently I noticed the lump near our 15 year old little dog had grown tremendously and immediately brought her to Pittwater Vet. The staff and doctors there were amazing from the moment we stepped through the door. The operation and recovery went smoothly and she is back to herself thanks to everyone that looked after her from day 1. I would not trust anyone else except for the amazing team at Pittwater Animal Hospital. Thank you thank you thank you. PAH has been our vet clinic of choice for 8 years now, and we couldn’t be happier with the standard of care offered there. The biggest thing that sets them apart is that the staff are all genuine animal lovers who strive to get to know all their human and animal clients beyond the file. We hope to continue to entrust our fur babies to them for many years to come! They seem to drag out consultations to justify their fee. For example if you make an appointment with the vet because your dog has skin allergy and is scratching excessively. They will write you a script for anti- inflammatory medication and some super expensive shampoo and conditioner. However, if the consultation in total has only taken five to ten minutes, they will offer up hypothetical problems that could possibly affect your animal's health, then provide expensive solutions. Or they will praise the benefits of pet insurance or some other expensive preventative medicine to prevent tic bites or something like that. Sometimes the line between commercialism, animal husbandry and the poor paying dog owner become blurred I guess. Just my 2 cents worth. Vets are great. Most nurses are friendly, patient and welcoming. Parking is tight but usually there are available spots. This vet also offers puppy preschool which is great!